Today Total_Noob has released his long awaited 6.60TN-B and the title for the new exploitable game. Check out the changelog and the download link below. 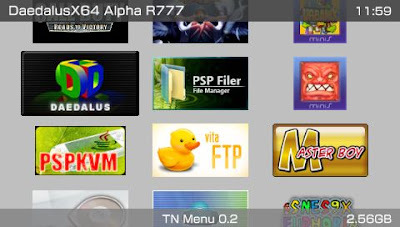 - Added more patches to get higher games compatibility. - Fixed bug that makes incompatibility with some games. (this also fixes bug that freezes your PSVita when you return from PSVita Menu to the backup game or when you resume the device). - Set CPU speed to 333 (experimental, not tested yet). - Removed hardcoded offsets and savedata path (makes porting CEF very easily). - FAKE.ISO is not needed anymore. - Forge "." and ".." entries in directories, because the PSPEmu does not read them. This increases compatibility with many homebrews. - Added ability to move backup games to ms0:/ISO (by pressing X on the game). - Added ability to load purchased PSN games. - In the progress bar now it shows the speed instead of the past seconds. - Added configuration menu (show it by pressing ). - Using ISO/CSO reader by Takka. - Added memory free space.